In his prime, Vince Carter was one of the most dynamic players in the NBA. One of several players touted as the next Michael Jordan, Vince Carter provided a lengthy highlight reel filled with thrilling dunks and three-point shooting. Based on his elite play and exciting style, Vince Carter became known as "Vinsanity." Like most, he did not fulfill the Jordan comparisons and could never make that transition from star to superstar. With his retirement rapidly approaching, Vince Carter cards and memorabilia still maintain strong interest from collectors. 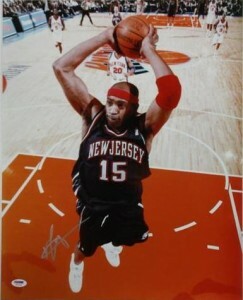 The spotlight followed Vince Carter from an early age and he was named a McDonald's High School All-American. After playing college basketball with the University of North Carolina, Carter was selected 5th overall by the Golden State Warriors in the 1998 NBA Draft. He was immediately dealt to Toronto in exchange for the number four pick, fellow Tar Heel, Antwan Jamison. 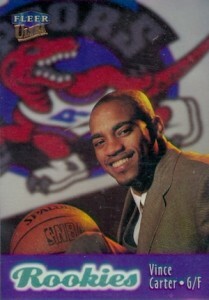 After a stellar inaugural campaign, Carter was named the 1999 NBA Rookie of the Year. Vince Carter has spent time with several NBA teams over his impressive career. In addition to Toronto, the eight-time NBA All-Star played for the New Jersey Nets, Orlando Magic, Phoenix Suns and currently for the Dallas Mavericks. Although the late-90's products were a blockbuster time for inserts and parallels, most rookie cards did not enjoy the same values. 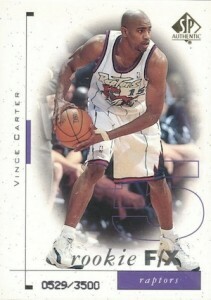 Because of this, the majority of Vince Carter cards from his rookie season fall in the budget and mid-range values. The highest values can be found among the many rookie parallels. Two Vince Carter cards stand out because they are the only serial numbered base rookie card options. While there are no autographed rookie cards for Vince Carter, there are plenty of autographed cards available from throughout his career. 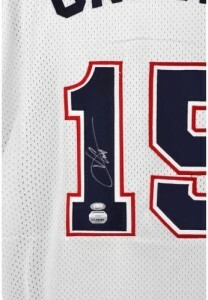 Also, his authentic autographed memorabilia is very reasonably priced. 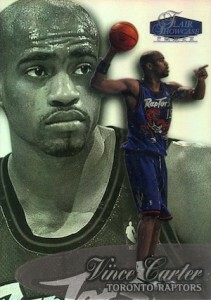 Despite the high numbering, Vince Carter's SP Authentic is among the top base rookie cards for "Air Canada." A varied assortment of text usage does make the design a little busy, but the shaded area does a great job of centering the attention squarely on Carter. If you have many leather-bound books and your apartment smells of rich mahogany, this might be the Vince Carter card for you. Oozing with class, this bold rookie card is numbered to 2,500. The forrest green and gold foil do seem to clash with the purple background. Radiance (#/1,500) and Spectrum (#/25) parallels offer additional options. 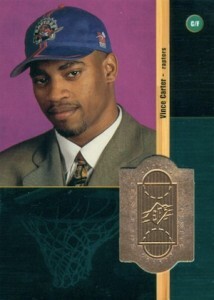 1998-99 Vince Carter TOPPS Rookie RC RARE! 1998 Vince Carter Ultra PSA Graded 8 Rookie Card. 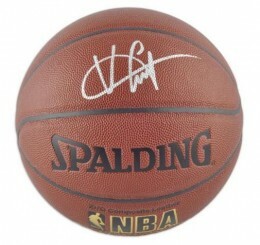 Below you will find an example of what Vince Carter's authentic signature looks like. This can be used as a first point of reference for determining the legitimacy of autograph memorabilia, but is not a substitute for having your items authenticated by a well respected professional autograph authentication company. Reputable authentication companies include JSA, PSA, Panini Authentic and Mounted Memories to name a few. Click on any of the images below to view full size photos.